Most of the people landing on my blog , are silent visitors, few oblige to comment , few are kind enough to share recipes and tips,while rest of them write for recipe requests specially for Pickles. I try to reply each and every query as and when time permits. 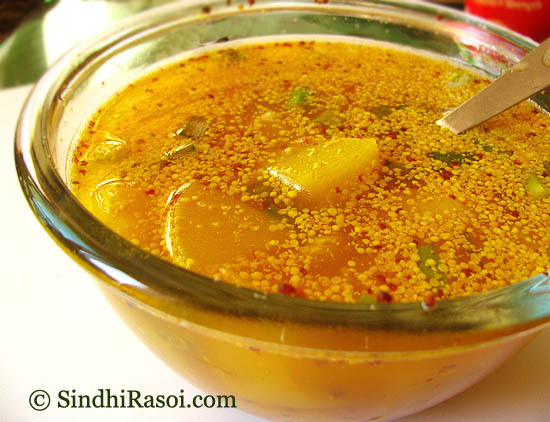 Majority of the people had requested for Sindhi AUR MEIN KHATAIRN or Pickle in mustard seeds(aur) and water . I kept postponing the idea to make this pickle for three reasons , one Hubby dear can’t stand the SMELL of pickles so these are big NO NO at our home, secondly, pickles are not good for health because of their excess oil or salt/sugar content and thirdly because this pickle has cooling effect on body so these are best consumed in Summer season which is still far away as per Indian Calender. But after replying many of people, individually via E-mails , I thought to finally give in and prepared this Turnip pickle (minimum possible quantity). So here I go, sharing this fool proof-quick fix pickle , which is ridiculously simple to make, and fast to mature. In fact this pickle should always be made in small batches, because it has small shelf life (it sours pretty fast) if kept outside the refrigerator . 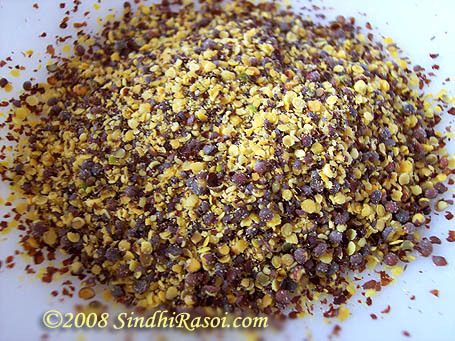 Meanwhile crush /or slightly grind mustard seeds, taking care as not to powder the seeds.It should be coarse as shown in the pic. 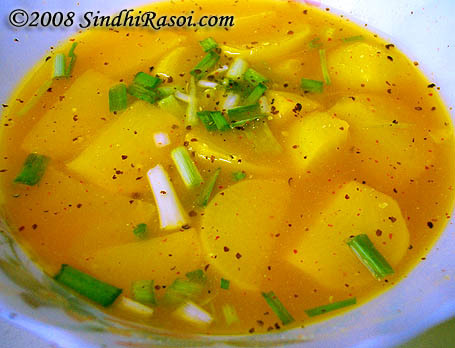 In an open vessel like handi, boil turnips with water, salt and turmeric powder.Water should be above the level of turnips. Do not be scared while adding salt and turmeric, since we are not going to boil it for too long for turnips to absorb extra quantity of salt and moreover this water is to be discarded, so add salt and turmeric without bothering much. let the water reach the boiling point, simmer it for a minute or so and put off the flame. Now take out the boiled turnips on a plate and let them cool completely. Now put the crushed mustard seeds in this jar, add cooled turnips and keep on adding water (plain drinking water) above the level of turnips. Again this is very forgiving recipe so do not worry about the exact measures. Now again add less than ¼ tsp of turmeric powder, 1 tsp of red chilly powder, chopped fresh green garlic and close the lid. Shake the jar well so as to mix the ingredients properly. The mustard seeds will appear to sink at the bottom of jar, but you need not worry about it. Once the mustard seeds change its colour from blackish yellow to complete yellow, the pickle is ready. The mustard water taste good when few spoons of it are poured over hot Khichdi (Indian style rice Risotto). 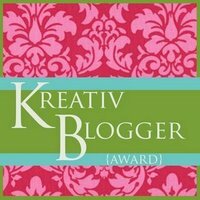 Let me hold on these awards for some time, I will surely pass on all of these wonderful awards to lovely bloggers ASAP ! I have looked for it all over and cannot find it. My nani used to make it. 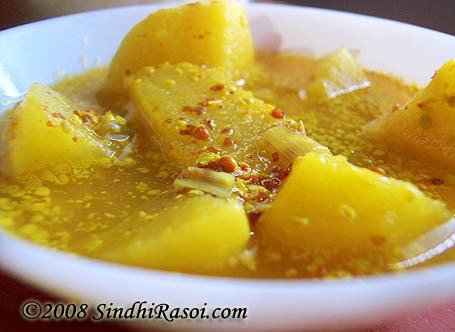 Plesant surprise to see a post on turnip ka achaar..reminds of of my mom, her fav one…. 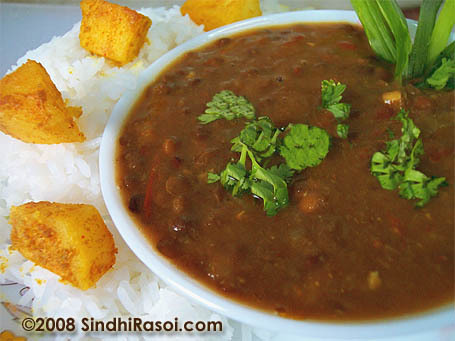 Thanks for this lovely recipe, try using “rai dal” and see the difference. Rai dal is same as mustard seeds only the outer skin is removed and the pickle taste better (less bitter) and the colour is lovely. We Sindhis add Cauliflower, lotus roots,whole small onions,Ghogru (Turnips), fresh garlic, Carrot,Mooli, etc.This is 100% Sindhi recipe. In market lots of “Mongri” is now in season and cheap too. 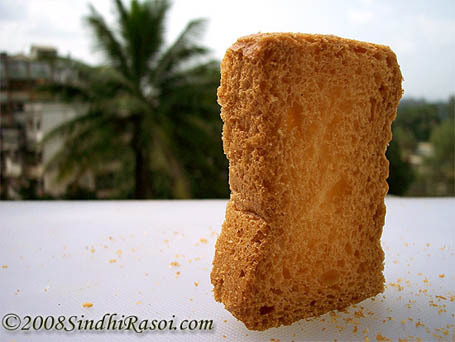 Mongri(Marathi) and its called Dongri in Gujrati. This vegetable is like cluster beans but round in shape. Few days back I bought these and asked my wife to add these too to the “pani vari khatair”…..Its really yummy and healthy too. I will soon find the English name and let u know. Its called “snake radish” or rat’s tail in English. Am glad to find the turnip receipe and will substitue carrots. Was surprised to find so much on Sindhi food, etc. Love it. I’ve had turnip pickle before, but from a Lebanese recipe. Very good. 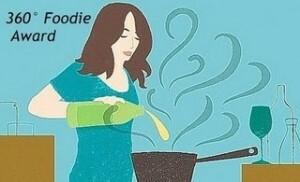 I’d like to try this recipe as well … and we have a crock here. Do you have a recipe for lime or lemon pickle? I like it very much and would like to make it here. Just the colour alone makes me want to have some of this. 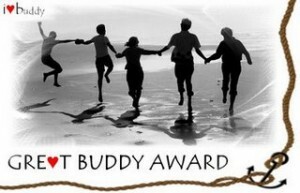 & adding u to my links. I have tasted this liquid in another pickle. Turnips would be nice in it! Will try this one out! 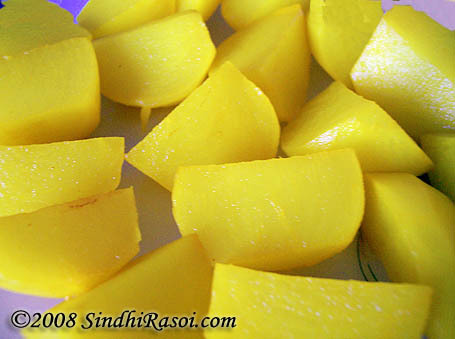 I think Haryanavis too make something similar because I ate this as radish pickle at one Aunty’s house from Haryana. Any idea whether it is the same? i adore turnips. thanks for a great recipe. Wow, Rai dal is nothing but mustard seeds minus the skin? So if you get Rai dal, use it or just use pounded mustard seeds. what an interesting pickle. Never heard of this before. Thanks for introducing a lovely pickle. Pictures are captivating. Congrats on your awards. How interesting, never tried it before… the pics are very fresh and simple. This pickle looks awesome. I bet it makes a great paratha or thalipeeth accompaniment. Alka, I read your blog every week. 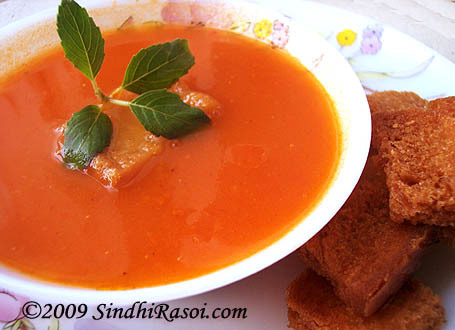 I’ve always loved Sindhi food, and now I can try to make my own. Thanks! Of course, I don’t comment too often and your line about silent blog readers hit home. I don’t think that’s going to change, but now you know another of your readers. Love the colour of the pickle, i didn’t know we could make pickles with turnip. So Uncle recommends “rai dal” and is 100% sure now. Add any boiled vegetable and see the result. One vegetable called “dugra” tastes lovely in this pani? Never heard of Mustard Dal, the AUR as we call in sindhi is Mustard seed i suppose ! Looks great, my family are pickle lovers and I love to try them at home. store bought ones are a big no no though. In US, it is a bit difficult to try all the pickles we make back in India so I tend to make the quick fix ones. This pickle looks delicious and a simple one too. I will try it someday. 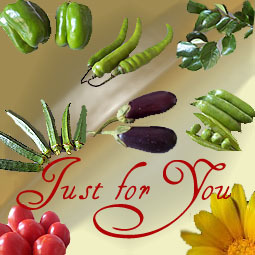 That sounds really wonderful way to pickle alka..beautiful pictures as usual! 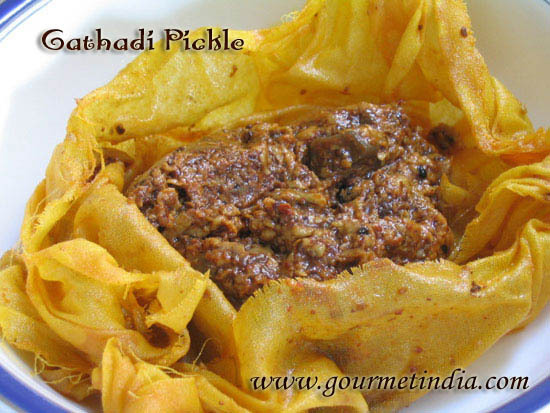 Lovely pickle which I love very much and sometimes also can be eaten as side dish. Many call it “paniwari khatyar” or Water pickle. Many vegetables, apart from turnip, are added. For example, cauliflower, carrot, lotus roots, fresh garlic (yummy),etc. I think mustard dal is used instead of mustard seeds? I am not sure? Wow, a no oil pickle. Sounds interesting. Love pickles of any kind. Of late, had to cut down due to health reasons. This one will fit in perfectly. Thanks for sharing.